“Jurassic World is a solid summer blockbuster–turn off your brain and just enjoy it.” That’s what I was told prior to my 3D dino disaster experience. But Jurassic World isn’t a commercial disaster; it unquestionably delivers and is a bona fide box office success. Jurassic World opened to $511.8 million worldwide — the highest global bow of all time at the box office opening weekend, and this movie titan will likely reign supreme for the weeks to come. But Jurassic World is exactly what it’s criticizing; people aren’t just ‘wow-ed” by dinosaurs anymore nor do animatronics uphold the scare-factor that 1993’s Jurassic Park created. 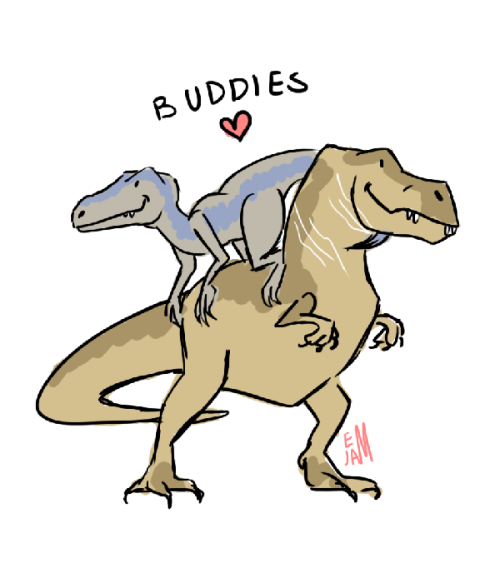 The dinosaurs have to be bigger, badder and scarier, because no one’s scared of “clever girl” velociraptor anymore. It’s been 22 years since Jurassic Park opened in 1993, and times have certainly changed for the summer blockbuster. My expectations weren’t high going into Jurassic World, but, nevertheless, I was enthusiastic about the resurrection of one of my childhood favorites. What I got instead of a saving grace sequel (The Lost World and Jurassic Park III are both forgettable) was a half-baked, over-saturated blockbuster of manufactured entertainment. Isn’t that what we’re supposed to expect from summer blockbusters in the 21st century? All flash and little substance? The bigger the boom the higher the dollar intake? I refuse to believe that a reboot doesn’t have the potential for both commercial success and cinematic greatness, but not even Star Lord could save this one. In the past summer blockbusters have included Jaws (the original summer blockbuster), Terminator 2: Judgment Day, E.T., Raiders of the Lost Ark and The Dark Knight. And I’m supposed to lower my standards for a franchise reboot, because it’s a summer blockbuster? When did we start dumbing down our standards? Jurassic World is a direct sequel to Jurassic Park allowing the dark Walt Disney John Hammond to have his park come to life on Isla Nublar. 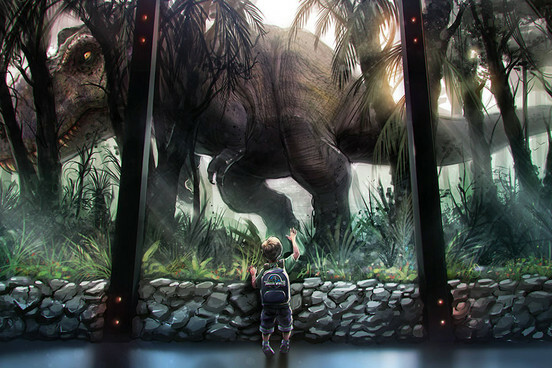 But while the first movie’s challenge was to get kids interested in dinosaurs again (“it just looks like a 6-foot turkey”), the new challenge of the park is to keep kids interested. That means the exhibits and animals need to be larger, louder and more violent. While park-goers demand to be entertained, the movie makes the mistake of being exactly what it’s calling out. In two lines, Jurassic World­ perfectly encapsulates everything that’s gone awry with the summer blockbuster, even if the movie fails to heed its own advice. With every blockbuster that arrives in theaters, the wow factor grows ever higher — even as our emotional investment in its heroes gets lower and lower. Jurassic World introduces a new species genetically modified by the park scientists, the Indominus rex. The Indominus rex is genetically modified with the DNA of several predatory dinosaurs as well as modern animals such as cuttlefish and tree frogs. Simon Masrani, the park’s owner, orders for velociraptor trainer Owen Grady (Chris Pratt) to inspect the Indominus’ enclosure before the exhibit opens. Things go wrong, chaos ensues, people die, etc. Unfortunately 22 years have not made scientists any wiser; in fact, it doesn’t seem like they’ve learned from their mistakes at all. “She clawed out her tracking chip”, “She’s killing for sport”, “They’re communicating”, “She’s a highly intelligent animal”. It appears that all the lessons learned from Jurassic Park fall deaf rendering the plot to become repetitive and predictable. Spielberg’s directorial stand-in is Colin Trevorrow who’s made only one prior feature, the quirky Safety Not Guaranteed (Spielberg only signed on as a producer). But it feels like this is one titanic project that Trevorrow doesn’t have the power or experience to steer toward classic status. When audiences first saw the T-Rex in Jurassic Park, Steven Spielberg wanted the viewer to see it from inside the cars so the audience would feel like they’re experiencing the T-Rex right there with the characters and feeling their fear. Jurassic World doesn’t possess this rare excitement, and it doesn’t make me feel like I’m experiencing my childhood relived. Most of it feels too overly-saturated with CGI or constant déjà vu with scenes that I feel like I’ve seen before. But that has a lot to do with the script, editing and direction. FilmFad’s Jurassic Park equation of “bring people to see dinosaurs + dinosaurs are underestimated = dinosaurs kill people worked great in the original, but as we saw from two other sequels it is not enough to sustain the film or the franchise.” The movie relies too heavily on the original for both content and nostalgia, but doesn’t produce anything truly new that has the potential to impress or make me invested in the future of the franchise. Everything feels like a spoof of the original movie; there were numerous scenes that appeared to be exact copies from the original film. I appreciate the attempt to help me to reconnect with my childhood, but even the reuse of John Williams’ original score feels like a knock-off of the original. As much as I want to buy what they’re selling, I can’t. Perhaps my disappointment stems from having high expectations or maybe seeing a reboot like Mad Max: Fury Road set the bar too high for a summer blockbuster? Maybe if the script developed more in-depth characters that I cared about, I would have been more invested in the film. The lack of intimacy makes me wish writers had focused closer on the finer details despite the film undergoing multiple script re-writes. Maybe I wanted more science-fiction horror than a predominantly predictable action flick? I’m not sure what I expected to get. Jurassic World is a blast both literally and figuratively. It delivers all the commonplace summer blockbuster ingredients to make one hell of a recipe, but call me crazy to not buy into this manufactured entertainment. Many thanks for this. I’ll doubtless see the movie at some point on cable/DVD, but you’ve reinforced my decision to give it a miss at the cinema. I don’t want to dissuade you from seeing it on the big screen, but I just don’t want people to buy into the hype that it’s a masterpiece of a sequel. Thanks! I hope you decide to review Jurassic World after you see it, because I’m really curious to what your opinion will be on this one! Nice review! The box office impact it achieved made me wonder if I should see it in theatres. Chris Pratt and nostalgia is the major draw but if the characters/premise/etc. are lacking than I’ll probably wait until later. There are a lot of inconsistencies with the previous sequels, but the characters are, at least, okay and the CGI is effective. Very interesting review… I’ll be seeing this soon but I really don’t know how I’m going to react to it. There are a real range of reviews out there! Thank you! See it with an open mind, and I’ll look forward to your review! I’ll do my best to! Hi Courtney! I agree with you. I think I enjoyed the film a little more, but it was a pretty idiotic popcorn flick. I love your last gif with the raptors on motorcycles. 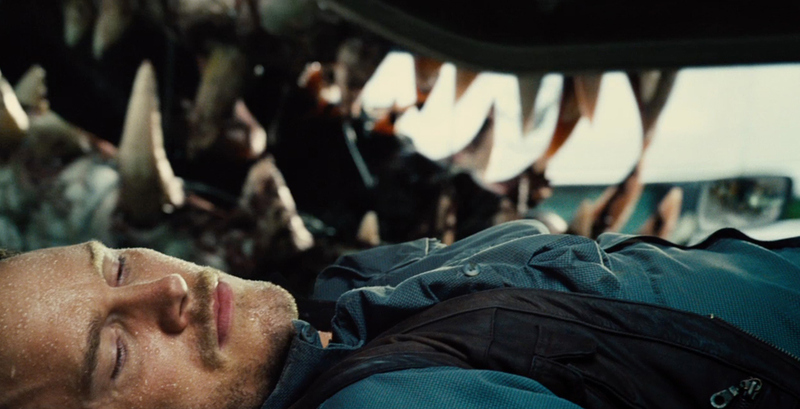 The ending with the raptor head nod to Chris Pratt was almost more than I could bear. I can’t believe this movie made $511 million, whereas Fury Road made $40 it’s first weekend. That in of itself is disappointing. The young girl (7 or 8) who sat on the same row (who was well behaved so kudos to her and her parents) respectfully disagrees as do I. I still felt they were pretty scary in this version, the way they all turned their heads to look at the humans (after chatting with the new alpha) made me chuckle nervously. My reaction to the nostalgia was completely different to yours, it made me smile and I felt the John Williams soundtrack was perfectly utilised. I’d agree the characters were a bit bland, so bland I barely mentioned them myself. I had fun with this, which is most important for a blockbuster. It’s definitely a fun movie, but maybe the CGI effects are what killed the scare factor for me…? Respect your opinion, even though I disagree with it. For me, the movie delivered, it was entertaining at times brutal, but all together very enjoyable. I agree, it isn’t even close to the first one, but I found it to be pretty good nonetheless. Thanks for commenting! Good to see varying opinions here! I liked this one more than you, mainly because I had no expectations. I liked, to a certain degree, the first sequel and LOATHED the third movie, so I was really only seeing this for Pratt, and I was pleasantly surprised that it was very exciting. Yes, it felt like lots of repeat moments from the other films, but it was done in a way that made it work, sort of. It’s very flawed, and for all intents and purposes…not a good film, but it was a blast to see in the theater. I don’t know, I mean, I agree with you in the sense that its not a masterpiece, but I will say that it was entertaining and a decent sequel, in many ways better than previous sequels, which felt pointless. To me Jurassic World has a good pace, it presents us with its premise and slowly but surely takes us into disaster, that’s always been the Jurassic Park formula since day one. The second and third films didn’t really continue with the concept of opening the park to the masses, this is what I enjoyed about this new one, that we finally get to see the park open. It’s not so much about “bigger and louder” because the dinos have always been big and loud, there’s no “bigger” dinos on this movie. It’s about finally opening the park and honestly it made me want to go and visit the park, made me want to be there. How cool was that scene when we get to see the whale dino? I think this one is about being more chaotic, though chaos has always been part of the equation as well. It makes it more exciting in my book. I agree that films need more heart and soul to them, this is something sorely missing from films today. Jurassic World had a bit of it….with the aunt and the kids..but it needed something else I agree. Perhaps a bit more peril for the main characters? More intensity, more scares? Still, the problem with films like this and many of the films being made today is that they never get too intense or scary because they cater to the pg-13 audience from the get go, so they keep things light and I think that’s the problem, the heart and intensity that people like us want from films is not being given to us because movies are being made with the cursed pg-13 rating in mind. I think this is why so many film buffs LOVED (myself included) Mad Max: Fury Road. It was intense, it wasn’t scared to be crazy or over the top, because it was an R film from the get go. We need more movies willing to be bonkers and intense. Movies willing to shake us up and make us feel! It’s like Orwell’s 1984, the system doesn’t want us to feel anything too intense, so we get vapid entertainment. I agree with you review to an extent, but I wouldn’t say it was a “disaster”, because it entertains, its a fun ride, it has cool effects even though they aren’t practical, an element I also miss from films in general. I guess we have to resign to the fact that films have changed, and CGI is here to stay. Sadly. It’s not a disaster; I just wouldn’t call it great. Fun? Yes, but not great. It showed shades of intelligent and creative metaphor, but that doesn’t change the fact that it was a SyFy Channel movie with a blockbuster budget… “People are dying here!! !” [Dramatic Pause and Deep Breath] “That’s unfortunate.” Apparently they didn’t use they budget to hire writers… I love the franchise, and do not regret the money and time that I spent, but let’s be real it’s a bad movie. Lovely write up! I just got out of this, and while I’d recommend it for a stupid popcorn flick, I had a lot of problems with it. Thanks, Brittani! Let me know if you review this one…I’d love to read what you have to say! Well written, concise. Don’t agree but I appreciate different perspectives. Great write-up Courtney. I enjoyed JW, but would probably only give it 3-3.5 because of all its shallowness. Pratt strutted about a bit too much, probably uncomfortable with his newfound mus-kels and Bryce was a let down. I expected Trevorrow to at least present some meaningful characters that’d make me fear for their safety, but I cared not two-shits for those kids which speaks volumes. I knew it would never top the original, and all the allusions to the first were reminders of how far they were missing their mark. A decent blockbuster, pitiful compared to Mad Max: Fury Road but sadly what I’ve come to expect as the summer norm. I know many people who are excusing the poorly written characters and stories by saying that “it’s a dinosaur movie”, but honestly, those weak elements drag down everything around it. Completely agree with this review. I thought it was fun in some places, but more often than not just plain stupid and sometimes mean-spirited (that assistant plot was so needlessly cruel). Definitely not crazy. This is 100% manufactured entertainment (great phrase). As far as summer flicks go these days, it was fine, but all told, it carries no weight. I asked a few kids I know who are the same age now I was when I saw Jurassic Park, and they all said Jurassic World was just “fun.” For us, Jurassic Park was fun and scary as hell. Big difference there. I thought it was fun,b ut kind of brainless, and of course, impossible to live up to the original. Superb review. Felt like a sugar rush really. It’s easy to get caught up in the exctitement, but there are so many flaws with the film. And I didn’t like the death of the assistant at all. Really didn’t fit with the film. Jurassic World was entertaining, I was never bored, but it was still a major disappointment. It carried no weight and not much substance and character development. Great review. I was far less kind in my review. I’m actually surprised anyone found anything entertaining about this monstrosity. It was a failure of T-Rex proportions. YES! Thank you for your honesty! I thought it was the worst!!! !